Usage notes: The French expression avoir l’esprit de l’escalier refers to an inability to think of a witty comeback (or any sort of intelligent response) until it’s too late to be of any use. Esprit means wit, and escalier, or staircase, symbolizes your departure from the gathering where the response was needed. But you can also use this expression while still at a party; for example, if you come up with a response only after the topic has changed and it’s too late for you to make your oh-so-brilliant comment without looking foolish. Lors de la réunion, Céleste m’a fait remarquer qu’il y avait plusieurs fautes d’orthographe dans mon dernier article. C’était de la pure méchanceté et j’ai eu l’esprit de l’escalier ; je n’ai même pas pensé à répliquer que tous ses articles à elle étaient relus par sa secrétaire. During the meeting, Céleste told me that there were several typos in my last article. It was out of sheer spite and I was speechless; it didn’t even occur to me to respond that all of her articles were proofread by her secretary. Matthieu m’a reproché d’être trop timide. J’aurais dû lui dire qu’il était exactement comme moi quand il était plus jeune, mais j’ai l’esprit de l’escalier et, comme d’habitude, je n’y ai pensé que le lendemain. Matthieu criticized me for being too shy. I should have told him that he was just like me when he was younger, but I have staircase wit and, as usual, didn’t think of it until the next day. 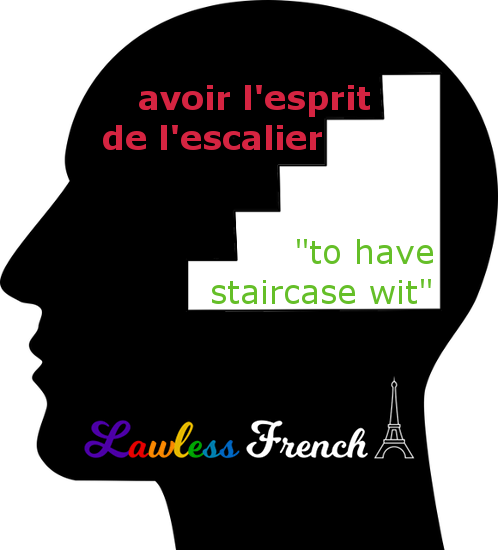 Note that when used in the present tense, the expression avoir l’esprit de l’escalier refers to an ongoing affliction, indicating that the person regularly suffers from “staircase wit.” To talk about a specific instance, use it in the passé composé. Next Don’t Lose Your French!